Hi there! 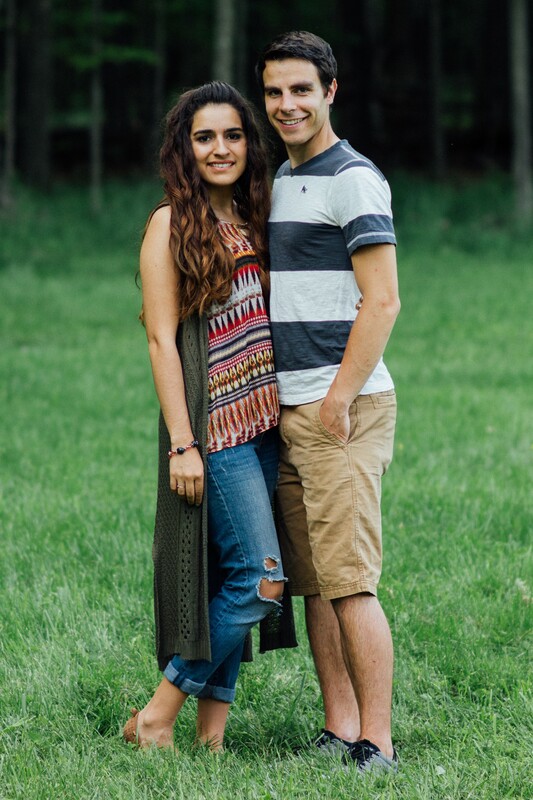 It’s been a while since we posted on here, but we would like to start posting weekly! I am here to talk a little bit about my trip to Trades of Hope Inspire 2018. I just want to do a little recap and then do a haul of all the things I got there, which of course is the fun part! If you are not sure what Trades of Hope is you can visit my website HERE. Trust me it’s amazing and you want to know about it so you’re gonna want to go check that out! The retreat was at the Rosen Shingle Creek Hotel in Orlando, Florida which is 30 minutes up the road from us so we ended up commuting back and forth. It was on Thursday night through Saturday, Luke really wished we were spending the night, but it wasn’t in the budget.. so that’s a goal for next year– that I actually make enough commission that we can fully pay for our own room, but commuting wasn’t too bad! On the way there it really was 30 minutes, but on the way back it’s like 11 o’clock at night when all the parks are closing around that time so there was a lot of traffic–it was so annoying but it was alright. It was really a blessing that we got the time off to go to the event and it was a really good for both of us! We were able to hear from the artisans from Guatemala that were there in person. We also got to hear from other artistans on videos while we were there, it’s a time of hearing about the impact of our sales this past year, and the impact that we have had through our Gifts of Hope program. It is a conference full of motivation and that we are able to be a strong voice for these artisans and that we need to be so that they can feed their babies and we can get more artisans in our groups. Luke got to be part of this thing called Bros of Hope, which is run by some of our founders’ husbands– he was able to learn how to there are strong men behind these strong women that are doing these amazing things with trades of hope and just learning how he can better support me and my business and how we actually can both be successful in this business if he stays behind me as my strongest supporter and leader. He really saw the Biblical view regarding that as well, and how Trades of Hope lines up with our values as a couple. Obviously we are a very mission minded couple, so Trades of Hope lines up perfectly with what we are passionate about. It was good for him to really catch the vision of Trades of Hope– He could only learn so much and try to understand it as best as He could based on what I had told him, but going to an event further proves the amazingness of it! He was able to see how even lil’ ol’ me working my lil’ ol’ business is truly making an impact and has so much potential for us. What he learned at Bros of Hope will and already has strengthened us in our relationship and my business, so thank you so much Trades of Hope for making that available and affordable! One of my favorite things about going to events is hearing from our artisans and our impact. One of the big reminders that I always need is that my success equals her success– I’m not just trying to be successful this business so that I can make a lot of money or for self recognition, but it is because I need to be successful so she can be successful. The more products I sell and the more people I sponsor, the more our marketplace expands and helps them to bring in more of a consistent income as well as bringing on more artisans who need jobs. Our artisans are always talking about how their friends need jobs and they’re coming and knocking on the doors but we won’t want we don’t want to take away consistent income from some of our artisans to bring on more, so we have to have a good steady flow of sales. The retreat definitely motivated me to want to invest more time into my business. My main takeaway is to be consistent. I’m really setting personal goals for myself to “touch” my business everyday even if it’s just for an hour and trying to set myself some business hours. As you can see I’m being a little more motivated on making this blog post and a Youtube Video! I am planning on posting more on the blog, posting on Instagram, being consistent every day. I plan on showing up to work every day, because my artisan sisters around the world that are my business partners show up to work every single day. The least I can do is do her the justice of being a voice for her– a voice for the woman who has no voice. Doing my job spreading the word is actually fun, so it’s not really work– I just have to come and do it! I want to show you all free product I got just for attending. Some things I got as gifts and some new things from our fall line. My ticket for Inspire was $150 and I actually fully paid for it with my commission, as well as Luke’s ticket for $35. 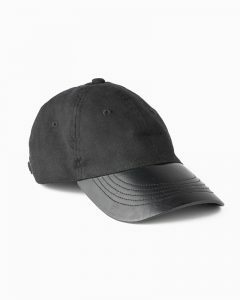 He was my guest and was able to attend the night events, and he got a free hat from our fall line! It’s very affordable to attend the event, especially considering all of the free product that you’re getting. You can see it as a business expense, which it is, but it’s a business investment if you actually go, use the things that you learn, work your business, and use it to further improve your business. Next we got the meta earrings which are part the Fall 2018 line. These are made of sustainably harvested Capiz shells and they are made in the Philippines. They’re a nice light gold and black and the theme for fall this year was Great Gatsby which they reflect so well. 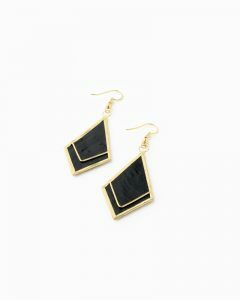 Shop the Meta Earrings HERE. Third, we got the Renewal Cuff. 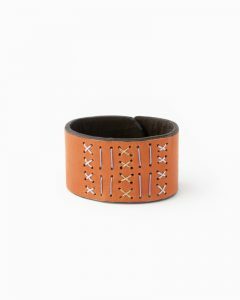 It is a genuine leather cuff made in Haiti, and it has cute little stitch designs on it. It is adjustable to different sizes, and I honestly think a guy could get away with wearing it– I tried to have Luke wear it already. I actually got to meet the artisans that make this cuff! When we were in Haiti back in the spring, we saw writing on their little white board that said, “TOH Cuff”, and we were like “what’s that going to be?” The leader on the trip was telling us not to look but it was too late. 😉 Shop the Renewal Leather Cuff HERE. Fourth, we were gifted the Prima Sari Necklace. 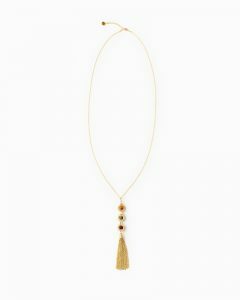 This is a nice long tassel necklace which is made out of recycled saris, so it comes in unique colors. It also has matching earrings and a matching bracelet! Shop the Prima Sari Necklace HERE. The last thing we got from the Fall 2018 line is the Kindred Tote, which is also made in India. 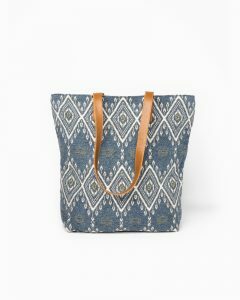 This tote has real leather straps, a zipper, lots of space inside, and is a hand-woven with golden thread mixed in. I love that it’s very “fall” and it’s kind of like a vintage blue so it will go nicely into winter too. It’s a nice light, foldable bag– especially if you’re traveling. Shop the Kindred Tote HERE. I ended up getting a gift for being on the top sponsor and my team this year! I was not expecting this at all.. I got the Prisha Clutch which was in our last catalog. 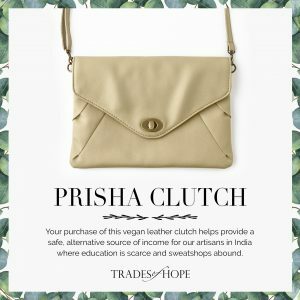 It is made in India out of vegan leather, has a long strap, and is a really nice muted color that goes with everything! I’m definitely going to be carrying this for a while, you can dress it up or down… it’s so adorable! I’m so happy and blessed to have gotten it! Shop the Prisha Clutch HERE. The last things I got were some things they were selling jut to CEs at a really good price! I’m not going to show them to you because… I am going to be doing giveaways starting this month! It hasn’t officially launched (stay tuned…), but I recommend going ahead and getting yourself entered for when I start doing. All you have to do is be on my email list for Trades of Hope! 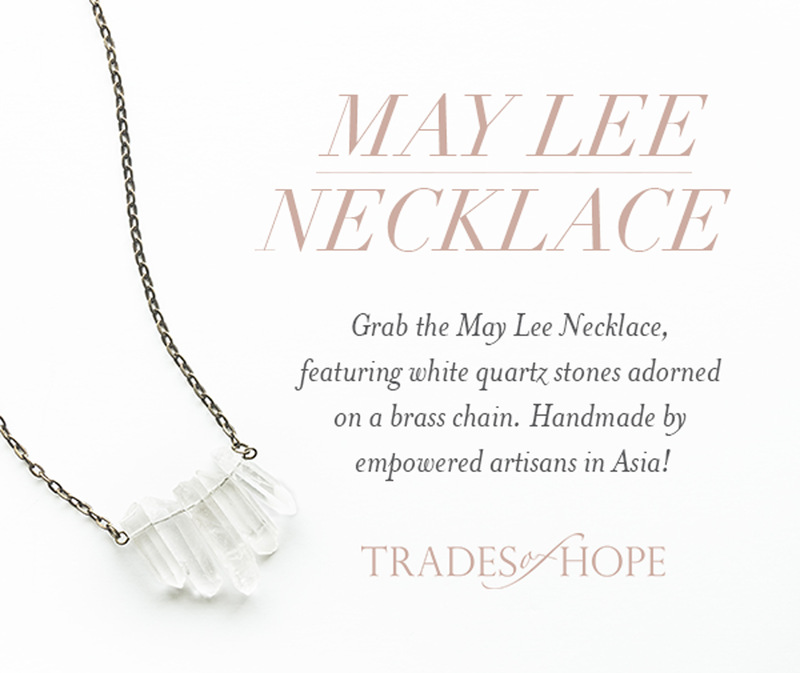 I’m going to enter your name into a giveaway every single month to get free trades of hope products! At the retreat there was a HUGE announcement about this cool program we have going where can earn a trip to Guatemala!!! That is, if you work your business and get a certain amount of personal sales. I’ll be talking about that in another blog post, but that it was very exciting, and I would love to work my way to get there! So for $150 I got not only awesome training, to bond with my fellow Compassionate Entrepreneur sisters, but I also got at least $2-300 worth of free product so that’s crazy amazing this is one of the other awesome reasons why you should become a Comassionate Entreprenru! Join me in this awesome sisterhood and make a difference around the globe from right here in the United States! Thank you so much for reading this post and feel free to subscribe to us for more videos and more information about Trades of Hope and more of our crazy adventures!